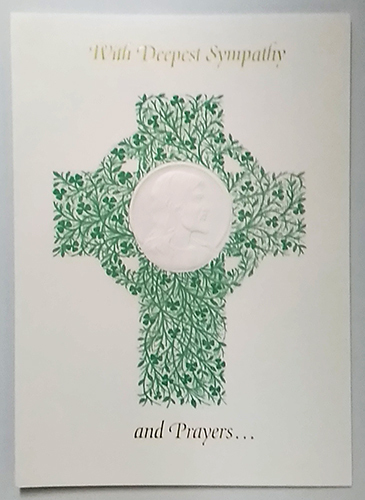 Irish sympathy card features a Celtic cross of shamrocks along with Jesus Christ embossed in the center. INSIDE: May the good Lord lighten your darkness, and grant you peace. This Irish sympathy card features an embossed and gold foil design along with a blessing inside. The Irish sympathy card is made of heavy card stock and measure 5” wide x 7” tall; an envelope is included. This Irish blessing card is made in the United States.